Mariam rides a bus home from the doctor’s, where she learned that she’s pregnant. Rasheed is in an excellent mood and is convinced that it’s a boy. He points out the window where the first snow of the year is falling, and Mariam wonders if the first snowfall is so enthralling because it’s a new, pure beginning before being trampled and growing corrupted. Mariam’s thoughts on the new snowfall serve as both a symbol and a warning. The baby growing inside her could be considered another new beginning; but Mariam seems to suggest that all such beginnings are corrupted, or at least that it’s never sure that they won’t be. The next day Mariam finds Rasheed building a crib that the baby, which he continues to refer to as a “he.” Mariam is anxious about this expectation, especially when Rasheed buys a boy’s winter coat and worries about boys’ reckless behavior. Rasheed does not only want a son to replace the son he lost. To a man like him, boys are always far more desirable than girls given the dominant role they play and the special rights they enjoy in Afghan society. The next night, Rasheed invites friends over to celebrate. Mariam cooks and cleans all day. She sits upstairs as the men laugh and eat below and thinks about how far she’s traveled to get to where she is now. She is thrilled to think of this baby—a true mark of belonging for her and Rasheed—and knows she no longer needs to play pebble games and mimic love. When she thinks of the baby, the grief and loneliness of her life seem to fade. She recalls a prayer from the Koran that Mullah Faizullah had taught her, and prays that God not take away this good fortune. Mariam remains convinced that happiness awaits her and Rasheed together, especially with a child that will bind them together even more. Mariam already loves her child unconditionally—a feeling that, for her, is closely tied to belonging. This moment seems to her to be a turning point, after which all Nana’s warnings about her place in life will prove unwarranted. Following that night, Mariam attends a women’s hamam, where she is scrubbing herself when, suddenly, there is blood and pain. Fariba rushes over to take care of her. She takes another bus ride with Rasheed, who is no longer in a good mood. Once they arrive home, he fumes that “God’s will” is no kind of answer from a doctor. It’s snowing hard, and Mariam remembers how Nana said that each snowflake is the sigh of a woman suffering somewhere in the world. It turns out that the previous scene was a turning point, though not in the way Mariam imagined. The chapter ends with another bus ride and another snowfall, each of which recall an earlier, happier moment. Nevertheless, though the snow has not been “trampled” and “corrupted,” here the snow comes to stand in for female suffering. Baena, Victoria. "A Thousand Splendid Suns Part I: Chapter 13." LitCharts. LitCharts LLC, 28 Jul 2015. Web. 21 Apr 2019. Baena, Victoria. "A Thousand Splendid Suns Part I: Chapter 13." LitCharts LLC, July 28, 2015. 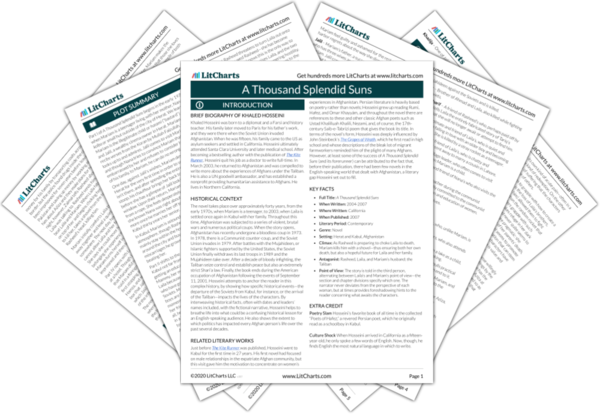 Retrieved April 21, 2019. https://www.litcharts.com/lit/a-thousand-splendid-suns/part-i-chapter-13.